Persephone's Orchard is an interesting read. I really enjoyed the premise of the story and liked the way Ringle wove the original myths into a fresh new tale. Adrian and Sophia are great characters, and on the whole I found their blooming relationship believable, given their past connections. The pacing of this book was good and there was plenty of action and advancement of the plot and characters. I struggled a little with the first third of Underworld's Daughter. So many new characters were suddenly given prominence and I'd not yet had time to connect with them as I had with Sophie and Adrian. However, by the halfway mark I was completely wrapped up in the story again and even shed a few tears at the sad moments (of which there are several, so have tissues handy). All in all, this middle part of the trilogy left me eager to get to the final book and see how it would all end. 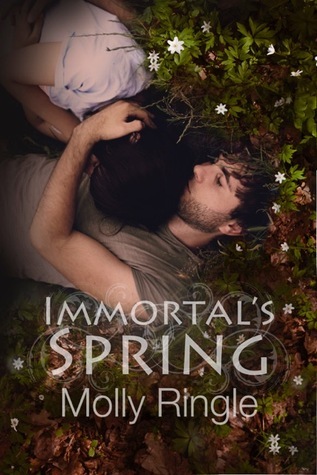 Immortal's Spring offers an eminently satisfying conclusion to the trilogy. All the plot points and character arcs are neatly wrapped up, and in a pleasing way; there is still plenty of character development through this final book; and it is as action-packed and well paced as the earlier volumes. I was always anxious to keep turning the pages to see what would happen and how it would all end, and that's why I give this book five stars. It's not that it's better than the earlier two, to which I awarded four stars, but it gets the five for concluding the story in a way that answered all my questions and didn't leave me disappointed or thinking there should be more.